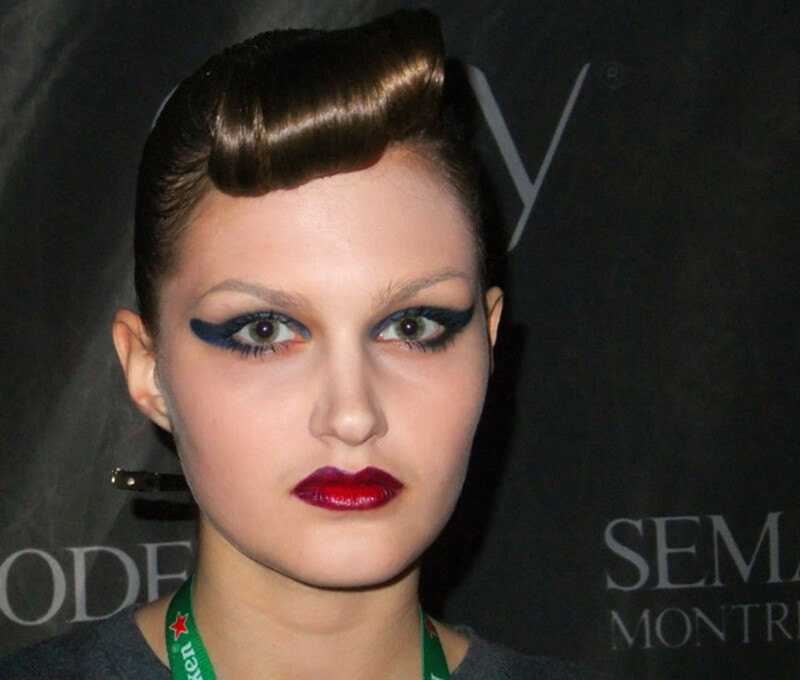 Overdone, blunt winged liner and a hair look that left a large team of stylists without mousse-can and hairspray-tin covers. 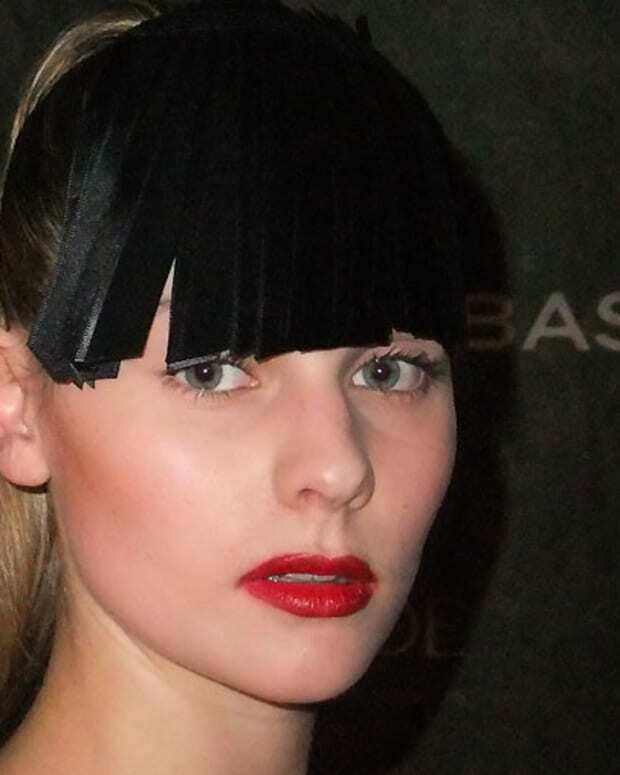 At the Samuel Dong Fall/Winter 2012 runway show at Montreal Fashion Week, models looked as though they&apos;d gone overboard with a blunt eye pencil and left a roller in their bangs. Covergirl LiquilineBlast Eyeliner in Blue Blaze served as the base of the eye makeup, thick and roughly extended. Eye Enhancers 1-Kit Shadow in #440 Shimmering Onyx applied on top darkened the shade to navy. "It&apos;s overdone, and rounded like the models did it themselves," said Amelie Ducharme, chief makeup artist for MFW, and Quebec Covergirl pro. Brows were lightly brushed with concealer to make the liner seem even more obvious. Lips were dark with Lip Perfection Lipliner in #220 Sophisticated and Lip Perfection Lipstick in #335 Embrace; a dab of Lip Perfection Lipstick in #305 Hot in the centre added dimension. And thanks to this particular show, a large team of Montreal hairstylists is missing the caps to their mousse and hairspray tins. "It&apos;s two textures, very controlled, but with a natural ponytail," said MFW chief hair stylist and Quebec Pantene/Clairol pro Denis Binet of the look. Stylists started by squeezing copious amounts of Pantene Pro-V Classic Gel directly onto the hair at the roots and combed it back to the crown, at which point the hair was tightly secured. 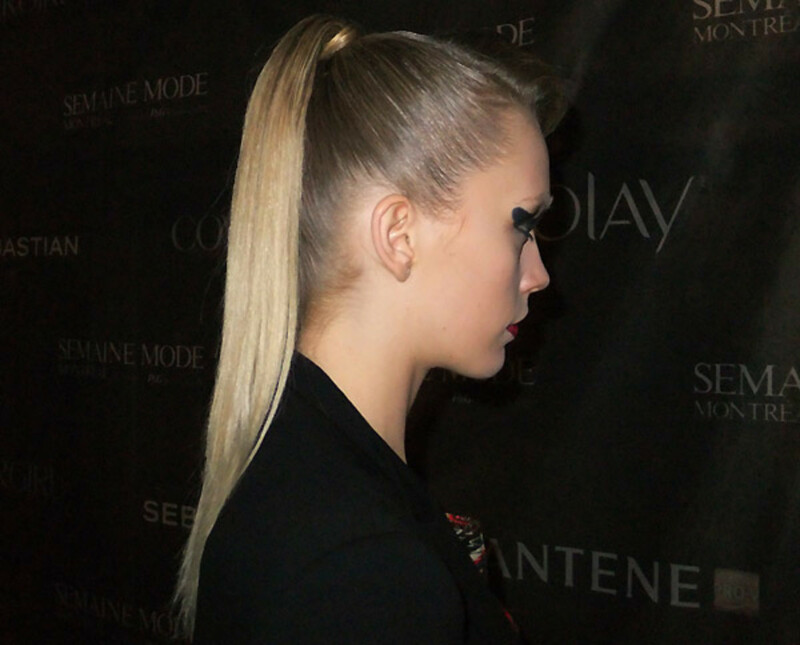 They then smoothed the ponytail straight but with a soft finish via Pantene Pro-V Fine Hair Solutions Hair Spray. To create the structured forward roll in the front, stylists combed forward a triangle-shaped section of hair and wound it in a warm -- not hot -- iron for one minute. 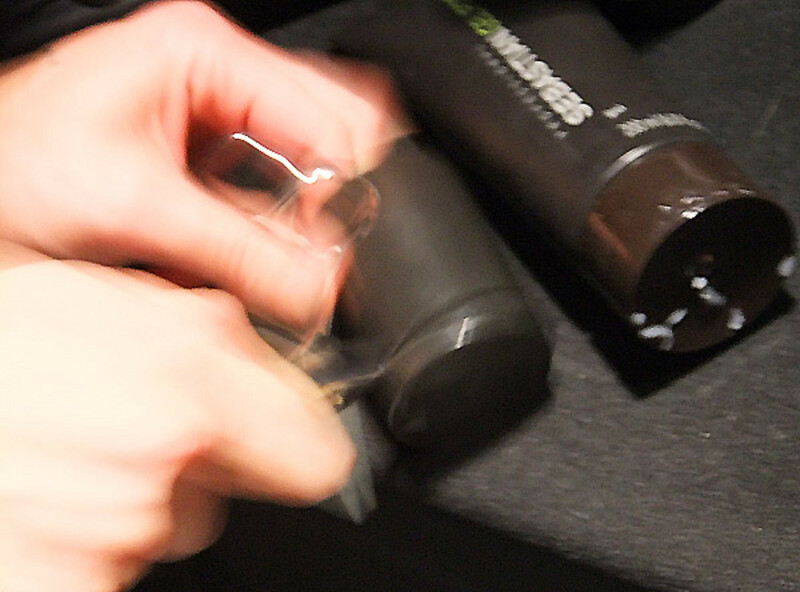 They slid the iron out carefully to maintain the curl shape, sprayed it with Sebastion Shaper Zero Gravity working hairspray immediately, then wound the hair around a plastic cap from a mousse or hairspray can, intending to remove the cylinder at the last moment before each model hit the runway. Models: Mira and Christiane, both Montage.